Once you arrive at the Bangalore railway station or international airport, get transferred to your pre-booked hotel. The rest of the day is free for leisure activities- interact with the locals, explore the surroundings on foot, taste the local delicacies etc. Overnight stay. Post breakfast, the 2nd day of the tour is scheduled for sightseeing. You visit popular tourist attractions like Lal Bagh, Cubbon Park, Botanical Gardens, Venkatappa art gallery and museum, Vidhan Soudha, Mahatma Gandhi road, Vishweshwaraya Museum and Ulsoor Lake. Overnight in Bangalore. On day 3, after breakfast, begin driving to Mysore. En- route, visit Srirangapatna- the capital of Hyder Ali and his son Tipu Sultan. Visit Tipu's Palace that is now in ruins, Gumbaz- the burial chamber of Tipu Sultan, his father Haider Ali and mother Fatima Begum and lastly, Tipu Sultan’s Summer Palace, known as Dariya Daulat Palace- built in the Indo-Sarcenic style. On arrival in Mysore, complete the check-in formalities at your hotel. The evening is booked for visiting Brindavan Gardens- a beautiful garden with colorful musical fountains and Krishnaraja Sagar dam in the evening. Stay Overnight. Post breakfast; explore the Maharaja Palace, also known as Mysore Palace or the Amba Vilas Palace - official residence of Wodeyars, the royal family of Mysore. Afterwards, visit the Nandi or Bull temple at the Chamundi Hills- a temple dedicated to Nandi (Bull), the vehicle of Lord Shiva. The next visit is to St. Philomena's Church – one of the oldest churches in India. Back to Mysore for visiting the Mysore Zoo. Overnight stay. On day 5, begin driving to Ooty, known as ‘Queen of Hill Stations. On the way, visit Bandipur National Park, an extremely well-known wildlife reserve of the southern part of India. Explore the wildlife here. Later, visit the fresh tea gardens where you can enjoy a leisure walk. Proceed to your hotel for check-in. 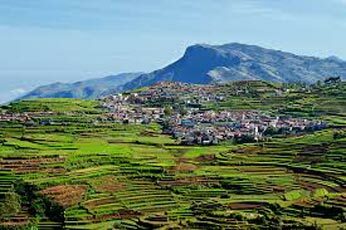 After some rest, continue with sightseeing covering Botanical Gardens, Ooty Lake and Doddabetta- the highest peak in the Nilgiri hills. Overnight stay. After breakfast on the 6th day, leave for an excursion to Coonoor to visit its tea gardens, Sim's Park- a 100-yr old garden housing a variety of trees, shrubs as well as creepers and Dolphin's Nose- a viewpoint situated over 1000 feet above sea level. Return to Ooty to visit popular film shooting locations. Overnight stay. Have breakfast and hit the road to Kodaikanal. En-route visit Palani temples including Palani Murugan, Avinankudi temple, Edumban temple, Kurunji Andavar temple and Periya Nayagi Amman. On reaching Kodaikanal, complete the check -in formalities at your hotel. The rest of the day is at leisure-explore the surroundings on foot, interact with the locals etc. Stay overnight. The 8th day of the tour is for exploring Kodaikanal. Enjoy boating and fishing at the Kodaikanal Lake. Later, visit Coaker's Walk, Green Valley View, Golf Links, Pillar Rocks, Silver Cascade Falls and Bear Shola Falls. Overnight in Kodaikanal. Today is the last of the tour, get on-time transfer to the airport or railway station of Coimbatore for your onward journey.